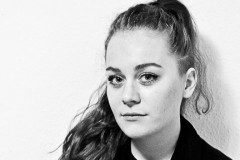 Angelika Hinterbrandner is a Sto Foundation and ARCH+ association scholar. Angelika Hinterbrandner studies architecture at the Technical University of Graz. During her architecture studies at the Technical University of Graz, Angelika spent time in Rotterdam, Hong Kong, Basel and Berlin, where she worked for MVRDV and Buchner Bründler Architekten, amongst others. At the Institute for Building Theory, where she worked as a student assistant, and as a project assistant at the "Sustainable construction" working group at the civil engineering faculty at TU Graz, she was also able to gain her first research and teaching experience. In addition to spatial, social and political implications of architecture – and their theoretical formulation – she is particularly interested in current trends in technology and communication. Her work oscillates between design, perception and analytical reflection.